What’s not to love about Christmas? I don’t love what we do with Santa Claus. First, there’s the whole “Santa Clais is real” thing. Why do we keep insisting with our children that Santa Claus is real, even when their young minds see some of the inconsistencies in the story? 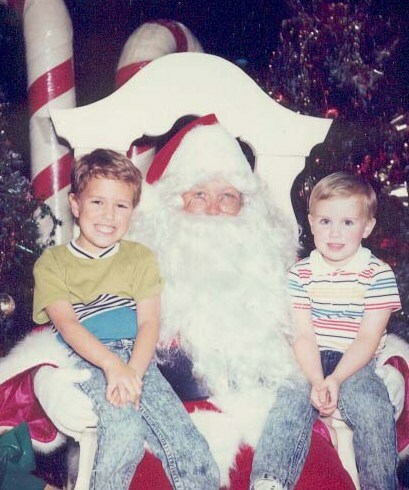 Before you scroll down to the comments section and leave a scathing remark that I don’t like children: we did the whole Santa Claus routine when our sons were little … and I plan to do it again when grandkids enter the picture. We had fun with Santa Claus—as a story. Did I rob my kids of any joy? Far from it. It’s no different than the way we enjoyed The Wizard of Oz without once thinking it was real. Because we’ve painted Santa to be godlike and all-knowing, we’ve painted the wrong picture of God. Too many people already view God as a keeper of a naughty or nice list. Be good, go to heaven. Do more bad than good, and you go to hell. Most religions and Eastern philosophies follow that thought, which is why a person has to work hard to make it to heaven. To be fair, the Bible also calls us to be good to go to heaven, but with one big difference. God calls us to always be good, to never falter or fail. God’s standard is perfection, and it is a demanding standard that far exceeds what any other religion calls for. And it’s a standard we can’t meet. Only the perfectly righteous make it to heaven, and we don’t cut it. None of us. The good news in all this is God’s love. He knows no one can meet that standard, so Jesus met it for us. That’s the whole point of the cross. He met the standard for us … and took the punishment we rightfully deserve for not meeting that standard. Let’s have fun with the story of Santa Claus, but let’s drop the whole God-like notion of keeping a list. There’s nothing fun about bad theology. Don’t let me get started on the whole Elf on a Shelf stuff. Next Next post: How Much Power Do You Need? I always enjoy these articles. Every now and then I just must pass them on.